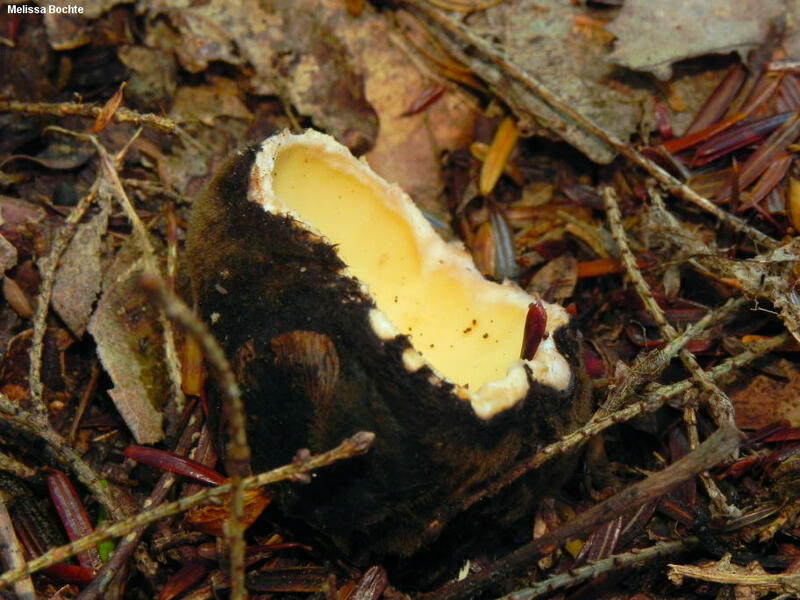 This interesting cup fungus is found from Connecticut to Ohio and Florida, but it is not often collected. On first glance it looks a lot like the more widely distributed (and much more common) Galiella rufa--but that species has decidedly gelatinous flesh, an upper surface that is usually more orange, and an outer surface that is velvety or very finely hairy; Wolfina aurantiopsis has solid flesh, a yellow upper surface that is only rarely orangish, and a decidedly hairy and woolly outer surface, at least when young. 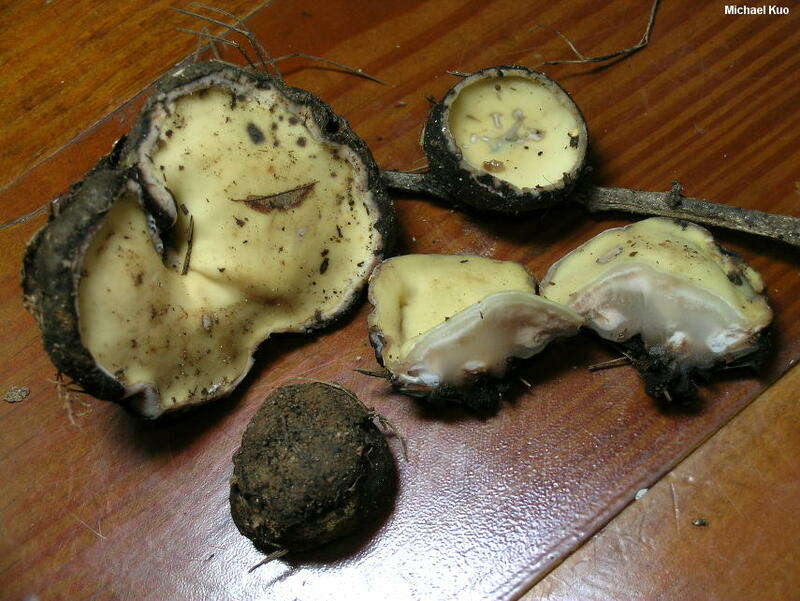 A recent phylogenetic study (Pfister, Slater & Hansen, 2008) placed Wolfina aurantiopsis--along with Chorioactis geaster and a handful of other rarely collected mushrooms in the genera Desmazierella and Neournula--in a new family, the Chorioactidaceae. The mushrooms share some similar micro-morphological features, including cyanophilic spores and warty to spiny hairs on the outer surface. Ecology: Saprobic on decaying hardwood sticks (which are sometimes buried); growing scattered to gregariously; summer and fall; Connecticut to Florida, west to Ohio. The described and illustrated collections are from North Carolina and Ohio. 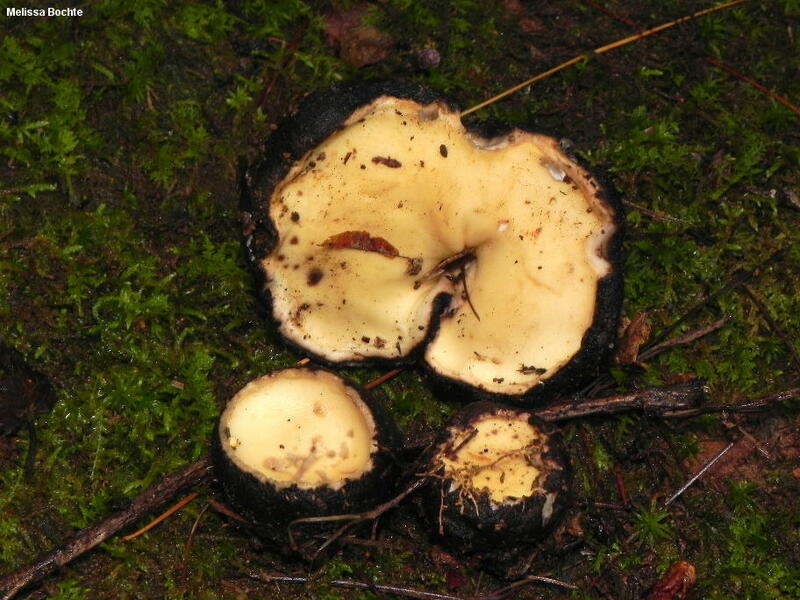 Fruiting Body: Cup shaped when young, becoming broadly cup shaped with age; 3-7 cm across; upper surface pale to bright yellow, bald; outer surface dark brown to nearly black, woolly to hairy, becoming more bald with age; flesh firm, yellowish to watery grayish, turning slowly purplish when sliced; odorless. Chemical Reactions: KOH and iron salts both negative on upper surface and on flesh. 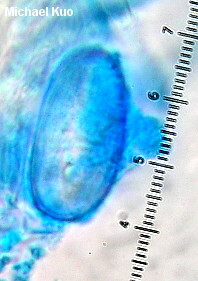 Microscopic Features: Spores 22-30 x 12-16 µ at maturity; very shallowly and subtly ridged lengthwise (best seen with cotton blue) but often appearing smooth or nearly so; ellipsoid; cyanophilic; hyaline, with granular contents, in KOH. Asci 8-spored; 200-300 x 10-15 µ; thick-walled; hyaline in KOH; tips inamyloid. 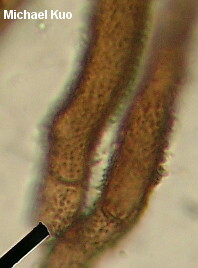 Paraphyses filiform; 250-300 x 2.5 µ; septate several times; apices rounded or subacute. 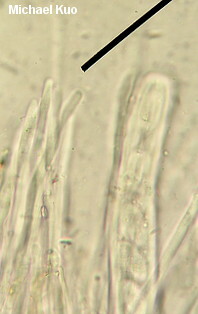 Excipular surface elements (hairs) 7-10 µ wide; often thick-walled; brownish to brown in KOH; finely warted or spiny ("prickled" in the words of Eckblad, 1968) walls near the basal portion, but smooth above. REFERENCES: (Ellis, 1882) Seaver, 1937 ex Eckblad, 1968. (Saccardo, 1889; Seaver, 1942; Eckblad, 1968; Roody, 2003; Pfister, Slater & Hansen, 2008; Agnello, Carbone & Braaten, 2013.) Herb. Kuo 07121202, 07291204.